We’d love your help. Let us know what’s wrong with this preview of Mr. Popper's Penguins by Richard Atwater. The Poppers unexpectedly come into possession of a penguin, then get a penguin from the zoo who mates with the first penguin to have 10 baby penguins. Before long, something must be done before they eat the Poppers out of house and home! A classic of American humor, this story of a gentle housepainter and his high stepping penguins has delighted children for generations. To ask other readers questions about Mr. Popper's Penguins, please sign up. Riley Sauder I do too! YAY! Obviously, I am taking this too seriously, but I found the financial ineptitude of Mr. Popper most distressing. Why have I shelved this as Hallowe'en read? Page 7, paragraph 4, second sentence: "I have papered all the rooms in the new apartment building on Elm Street"
the copy I have been sent, contrary to what I ordered, is this movie tie-in version and there are photos from the film in the middle. 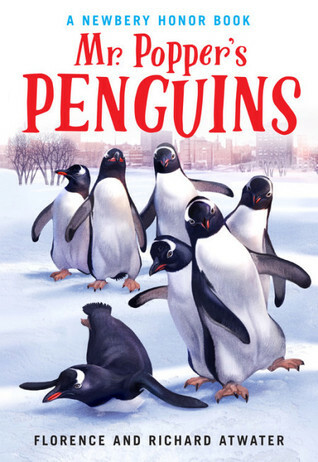 The story itself is lovely fun with only a couple of domestic violence against penguin scenes; perfect for reading outloud. I was really looking forward to re-reading Mr. Popper’s Penguins; however, as soon as I started reading this delightful book, I realized that I had never read it as a child. Good thing that I was able to make up for that omission now, in late middle age! 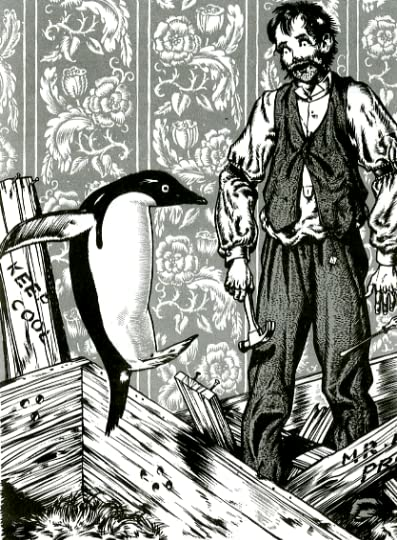 House painter Mr. Popper has always longed to be a polar explorer; after a letter to Antarctic explorer Admiral Drake, the admiral ships Mr. Popper a clever Gentoo penguin. The new arrival, dubbed Captain Cook after the English explorer, proceeds I was really looking forward to re-reading Mr. Popper’s Penguins; however, as soon as I started reading this delightful book, I realized that I had never read it as a child. Good thing that I was able to make up for that omission now, in late middle age! 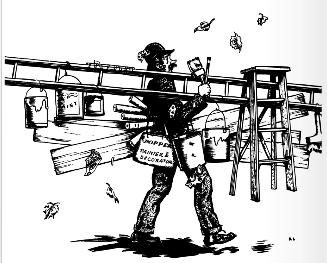 House painter Mr. Popper has always longed to be a polar explorer; after a letter to Antarctic explorer Admiral Drake, the admiral ships Mr. Popper a clever Gentoo penguin. The new arrival, dubbed Captain Cook after the English explorer, proceeds to change the lives of the Popper family in every way. I completely enjoyed Mr. Popper’s fulfilling his dream and appreciated the long-suffering Mrs. Popper. I believe that, even 70 years later, children would still love this book — and its intelligent, gentle penguins. 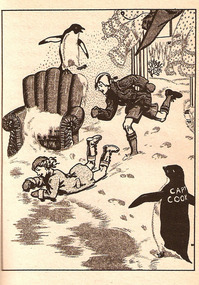 Surely, they’d envy the Popper children, Janie and Bill, who get to frolic with a flock of penguins! I have been aware of this book's existence since I was a kid, but somehow I never got around to reading it. The past few months the kids and I have been on an "animal stories" kick for our bedtime reading, but of course we like funny animal books, not dead dogs and horses, so I turned to this. What a little gem! I honestly didn't know what this book was about, except for what you can glean from the title (there's a guy, named Mr. Popper, he has penguins). 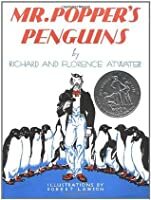 The story of how he gets the penguins, a I have been aware of this book's existence since I was a kid, but somehow I never got around to reading it. The past few months the kids and I have been on an "animal stories" kick for our bedtime reading, but of course we like funny animal books, not dead dogs and horses, so I turned to this. Now I never did read Richard and Florence Atwater's Newbery Honour winning novel Mr. Popper's Penguins as a child, and while I have in fact mildly enjoyed much if not most of it as a sweet and humour-full animal/people interaction tale, and can also understand why and how it is considered a classic and much beloved by many, as an older adult reading Mr. Popper's Penguins for the first time, the ending, with the penguins being sent to the Arctic just absolutely and totally rubs me the wrong way, Now I never did read Richard and Florence Atwater's Newbery Honour winning novel Mr. Popper's Penguins as a child, and while I have in fact mildly enjoyed much if not most of it as a sweet and humour-full animal/people interaction tale, and can also understand why and how it is considered a classic and much beloved by many, as an older adult reading Mr. Popper's Penguins for the first time, the ending, with the penguins being sent to the Arctic just absolutely and totally rubs me the wrong way, to the point that my emerging enjoyment of the rest of the novel (even with its datedness and issues of gender stratification) has sadly been completely rendered null and void. For let's face it, penguins are NOT Arctic but Antarctic animals and the idea of Mr. Popper's penguins being sent to the Arctic is basically a case of having an invasive animal species artificially transplanted into the Arctic, into a cold environs, yes, but still into an environment that for all intents and purposes is not the penguins' home and native land (and where they might very well and even likely negatively interfere with native Arctic bird species like dovekies, puffins, razorbills and the like). And while in 1938, the problems, the potential and serious consequences of invasive animal (and plant species) were of course not yet a commonly considered issue and as such a scenario to be avoided, I just have not been able to read Mr. Popper's Penguins without my late 20th and early 21st century eyes, without my ever increasing personal annoyance at the havoc invasive species have caused and are still causing to and for ecosystems around the world to be able to read and appreciate this novel and especially with its ending as simply a fun and engaging classic animal tale (because I just do NOT even remotely understand why Admiral Drake and by extension Mr. Popper could not have taken the Penguins to the Southern Hemisphere, to the Antarctic, the southern reaches of South America, to an area where penguins are meant to live, are endemic and native). My Four-Year-Old is just beginning to be interested in having chapter books read to her. But as she gets stressed out by conflict of any sort, it's kind of tough finding good candidates for her. This is a winner. For those of you who haven't read the book, the basic premise is that a house painter who spends his off-hours reading about (and writing to) explorers in the South Pole receives a penguin in the mail from one of those explorers. Since his work is over for the winter, he becomes very in My Four-Year-Old is just beginning to be interested in having chapter books read to her. But as she gets stressed out by conflict of any sort, it's kind of tough finding good candidates for her. This is a winner. For those of you who haven't read the book, the basic premise is that a house painter who spends his off-hours reading about (and writing to) explorers in the South Pole receives a penguin in the mail from one of those explorers. Since his work is over for the winter, he becomes very involved in the comfort and care of said penguin (and the eleven other penguins that quickly follow). In the end, he transforms his basement into an ice rink (an idea my daughter wholeheartedly supports, by the way), and spends more than his wife ever thought possible on fish and canned shrimp. I won't tell you how an out-of-work house painter manages to pay for all that (wouldn't want to spoil the ending), but I will say that the process is highly entertaining for all involved. I found myself looking forward to each night's installment of Mr. Popper nearly as much as The Four-Year-Old. Although I personally found the ending to be highly improbable, The Four-Year-Old saw nothing at all the matter with it--except for that little bit of unpleasantness with the policemen and firemen--and has spent many a happy evening reenacting the finale in the bathtub. And now, if you will excuse me, I need to go read Mr. Popper's Penguins to The Four-Year-Old again. I promised her I would as soon as I finished writing the review. There has apparently been a resurgance in interest in this 1938 childrens' book since I have been seeing it everywhere I go. Since I never read it growing up I thought I would give a read. The story while cute and age appropriate for 4-8 y/o seemed inadequate in some way... even for a kid's book. The ending totally turned me off of the book altogether (the father leaves for the Arctic for a year or two with barely a good-bye.) Maybe that was the whole problem I had with the book. The father was There has apparently been a resurgance in interest in this 1938 childrens' book since I have been seeing it everywhere I go. Since I never read it growing up I thought I would give a read. The story while cute and age appropriate for 4-8 y/o seemed inadequate in some way... even for a kid's book. The ending totally turned me off of the book altogether (the father leaves for the Arctic for a year or two with barely a good-bye.) Maybe that was the whole problem I had with the book. The father was so obsessed with the penguins that his family always came in second. This might seem cute and funny in a children's make believe story but in the real world when a parent spends their last dime on a hobby or obsession to the detriment of their family it just isn't so funny. Mr Popper is a DIRTBAG, and this book is ridiculous. I am sure it's because I'm too old to come to the book for the first time - my 4yo loved it until the end - but I couldn't get past the dumb dumbness of the whole situation. This was a fun book to read, which I valued for it's good old-fashioned lifestyle and language, and the imaginative and hilarious plot. It's one of those older books that are popular with kids for a reason, and adds a little fun to life. I couldn't keep reading because I kept thinking that the penguins could never survive in such a hot climate and Discovery Channel realism was intruding on the lighthearted nature of the story. This inspired a much better film. What I liked the most was how well the beginning pages illustrates how the Law of Attraction works! Mr. Poppers is immersed in his desire (penguins and Antarctica). So he reads about it, thinks about it, dreams about it, watches films about it, listens to a radio show about it....until he manifests a penguin on his porch! This is the correct formula that Law of Attraction teaches and how perfect for children...He holds his desire from a place of happiness (very This inspired a much better film. What I liked the most was how well the beginning pages illustrates how the Law of Attraction works! Mr. Poppers is immersed in his desire (penguins and Antarctica). So he reads about it, thinks about it, dreams about it, watches films about it, listens to a radio show about it....until he manifests a penguin on his porch! This is the correct formula that Law of Attraction teaches and how perfect for children...He holds his desire from a place of happiness (very important) and he is not bothered at all by reactions from others that may trip him up (like his wife who is always worrying about money). o poveste simpatică cu mulți pinguini curioși și o familie dispusă să le încurajeze năzbâtiile. Mr Popper is a mild mannered house painter who loves to listen to radio programs about penguins. So when an Admiral sends him a REAL penguin, he is delighted to have it for a pet. Only "Captain Cook" gets lonely, and needs a mate, so the Admiral sends "Greta". Soon there are 12 penguins living in the Poppers basement. And times are tough and the Poppers don't have much money to feed those penguins. What to do? This is a warm, funny, old fashioned family story that makes a wonderful read aloud. Su Mr Popper is a mild mannered house painter who loves to listen to radio programs about penguins. So when an Admiral sends him a REAL penguin, he is delighted to have it for a pet. Only "Captain Cook" gets lonely, and needs a mate, so the Admiral sends "Greta". Soon there are 12 penguins living in the Poppers basement. And times are tough and the Poppers don't have much money to feed those penguins. What to do? This is a very good book of a man that got one penguin in a box. After that he got one more. Then the new penguin got babies. There were ten penguins after the babies came. In the end of the book he goes to the south pole. If you want to know all the funny (sic) that happens to the Popper family, read the book. You can get it [in] our library. Finished this with my 8yr old last night. She seemed to really enjoy the book as we read it. We read this book as a part of her school's newest book reading adventure, One School, One Book and each day we had to read two chapters and then the next day, the kids would answer trivia questions to try and win prizes. It was a great way to get them to do more than just read the words, they had to comprehend what they were reading and hearing us read to them. As for the book, you can definitely tell thi Finished this with my 8yr old last night. She seemed to really enjoy the book as we read it. As for the book, you can definitely tell this was written many ages ago based on the dialect and the words used when the characters were speaking. That did take away a bit for my daughter to understand what they were saying when we had to stop and explain words or phrases. I read this as a child and really enjoyed it so I read it to my daughter. She really loved it and maybe I have to just remind myself that this is a book for the "younger folk." As an adult, when I read this, I just thought it was just Silly...silly, as in...this story doesn't make any sense at all and is just full of nonsense. Don't get me wrong, I love children's stories that have bits of fantasy to them: Ralph S. Mouse, Indian in the Cupboard, etc...It's just that, I found this to borderline th I read this as a child and really enjoyed it so I read it to my daughter. She really loved it and maybe I have to just remind myself that this is a book for the "younger folk." As an adult, when I read this, I just thought it was just Silly...silly, as in...this story doesn't make any sense at all and is just full of nonsense. Don't get me wrong, I love children's stories that have bits of fantasy to them: Ralph S. Mouse, Indian in the Cupboard, etc...It's just that, I found this to borderline the ridiculous. 1. First off, why would an explorer send a penguin to a common citizen? If he really were a good explorer/scientist, he would know that penguins can't really survive very well in a warmer environment and would Mr. Popper have the means of taking care of it? 2. And would someone really flood their house to make ice for their pet? 3. And get paid $5000 a week? That's a lot for these days, let alone in the 1940s. Doesn't make sense. 4. Okay, and Mrs. Popper is just "okay" with her husband being gone for 2 years...underlying marital issues there? Okay, so yes, I have issues with the story and yes, you might say that I'm being overly analytical about the whole thing. "It's just a funny imaginative story" you may say....But here's the thing: there is a way to make the imaginative into something that sounds real, like it could really really happen...and that's what makes a good storyteller. 1. Didn't like the dad leaving at the end with everyone happy or fine to see him go. The mom was just glad she didn't have to clean up after him. Heartless. 2. The references to money. Poor example of money management and debt acceptance. Absolutely not principles I am teaching my children. 3. Not a lot to like in mr popper. He was untidy. Lounged around all day in the winter. Wasn't worried about providing and deemed it his wife's problem to handle the money to feed the family. Z: "my favorite part was when they had the baby penguins". Q:"my favorite part was when they got in jail". This was a great one for both girls with short chapters and lots of silliness that got both girls giggling. I LOVED THIS SO MUCH WHEN I WAS YOUNGER! It's a great book! Makes itself right at home on the shelf of children's classics with books like Charlotte's Web, Little House Books, and so on. I do not know how I missed this book as a child. It was such a good story! The ending was a fun surprise. A sweet read aloud read for our family. We had a great discussion at the end of how Mr. Popper made the most loving choice for his penguins as he looked outside his own desires by sending them back with the Admiral to the North Pole because they would be happier and healthier there. I am sure we will be naming penguins after all the great explorers when we go to the zoo next! I read this to my 5 year old daughter each night. We really enjoyed it!